Unification Family Therapy: Does God Permit Evil? Is God Allowing the Suffering? Does God Permit Evil? Is God Allowing the Suffering? People ask, "Why did God make people die from cancer or accidents?" This message from the spirit world gives new light on what's happening behind the scene. Of course, this is incredible pain for God. This message from the spirit world, describes how Satan works to create these diseases and accidents, precisely with the purpose to accuse and hurt God. And of course, God did not kill his mother with cancer. He didn't want to allow that! He did everything possible to protect her from dying. The message from the spirit world, below, gives light on what's happening behind the scene. What people often forget is that evil comes from Satan. He works through our ancestors who are on his side. God always works to protect us, but often the conditions we or our ancestors made, prevent God from interfering. Even believers often neglect that Satan is the 'god' and 'master' of this world, not God. Because of the Fall of Adam and Eve, God lost the position of direct connection with us. We were born in Satan's lineage. Very few are on the spiritual level to respond to God's heart and will. So God is limited in what he can do in this world. That's why the evil was prospering, despite God's unceasing efforts to promote good. This explanation is dictated from a person in the spirit world. It enlightens the question of Why God is not always able to protect his children. "God created the angelic world to reach human beings wherever we are. God wants human beings to know Him and to feel His love so that He can create the eternal parent-child relationship with each of us. Angels can reach any place in the world. Sometimes some people drown while swimming in the sea. In these cases, what do angels do? Without any doubt, angels will do their utmost to save God's children. However, we have to understand on point clearly. There are angels working for God on God's side and there are angels and evil spirits working for Satan on the satanic side. In light of this, the outcome is determined by the conditions and environment of the person drowning. You must understand that there are numerous fierce fights between angels on God's side an on the satanic side. The defeat of the angels of God occurs not because their power is weaker than the satanic side. It is because the person is in a situation where the angels cannot help. If the person's mission belongs to the realm of Satan, angels' power cannot reach him." "God has been suffering as if He were a sinner until now... He has not been able to manifest himself to His full capacity although He is the Creator.. He has been enduring in darkness, unable to illuminate the whole world in His light. Until the arrival of the day of liberation, He could not experience peace in His heart nor could he fully manifest His light." "Thus far, numerous historical figures came and went, but no one could even imagine freeing God from the miasma of the human history of darkness. Other than the Messiah, who could ever know that such a secret of Heaven was hidden within the history of darkness." 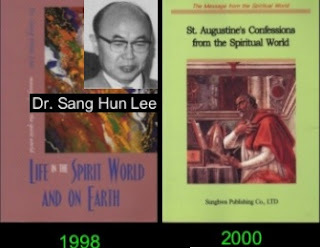 "Intellectuals do not know.. of the incredible beginning of the new Heaven and Earth... God has been waiting for the arrival of this day, which was brought into reality by reverend Sun Myung Moon." Terminology Used in "Clouds of Witnesses: The Saints' Testimonies"
Prepared by the FFWPU in conjunction with Christian scholars, pastors and theologians. Reflections of 120 Christians who illuminated history from a seminar in the spirit world.